Students walk to class as National Grid works to restore power to East campus. Keeping with tradition, rowdy UMass Lowell students took to the streets last Sunday to celebrate the New England Patriots sixth Super Bowl victory, not only in franchise history but also in most student’s lifetimes. The 13-3 victory, though it came in the 4th quarter of a slow matchup by way of the night’s only touchdown, managed to be an exciting ordeal, all things considered. And considering the empty beer cans strewn about East Campus the following morning, there was no shortage of substance consumption involved in the student celebration. In what seems to be an annual email from Dean of Student Affairs and Engagement James Kohl, students were asked to be in their best behavior win- or lose on Super Bowl Sunday. Judging by police reports and the words of UMass Lowell administrators, the student body celebrated in a respectful and responsible manner despite the country’s low expectations for both Boston and undergraduate sports fans alike. Unfortunately, regardless of good sporting behavior from students, the night was not without incident. At approximately 2:48 a.m. Monday morning, an hour or so after most students had returned to their apartments and residence halls, a silver motor vehicle barreled into a utility pole on the corner of Aiken and Perkins Streets. The operator of the motor vehicle, a non-student, was immediately admitted to Lowell General Hospital for her injuries Lowell Police Captain James Hodgdon told the Connector on Wednesday. According to Captain Hodgdon, the unnamed operator was also served with a summons to Lowell District Court for driving under the influence. 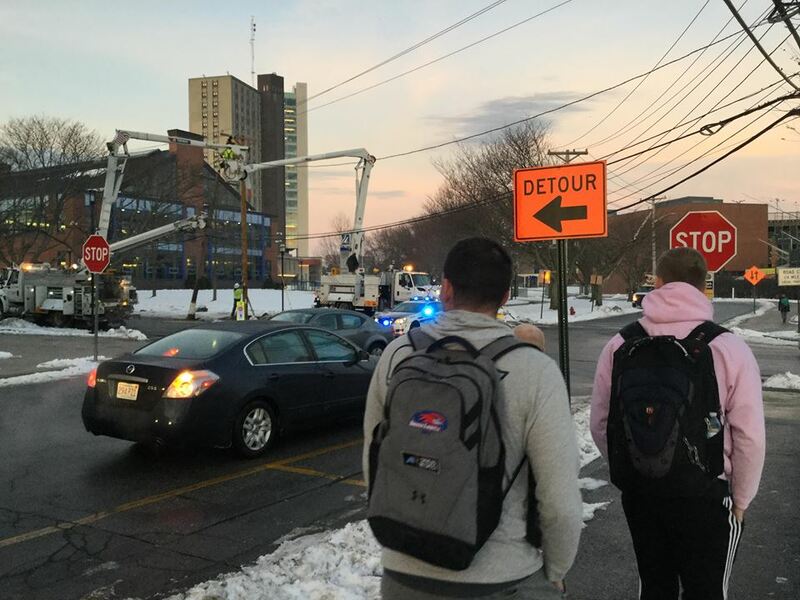 The utility pole which was mounted with a power distribution transformer that services the majority of UMass Lowell’s East Campus was dislodged and moved several feet. Power to all of the residence halls on East Campus was immediately lost. The utility pole, electrical wires, debris and the vehicle also managed to make quite a mess of the Aiken-Perkins intersection. As backup generators from River Hawk Village to Leitch Hall began to kick in to maintain baseline power across East Campus, UMass Lowell’s Emergency Management team was prepared to immediately work out a timely solution to the situation. “The process is really the same for any unannounced campus ‘event.’ Whether a storm came through that we just weren’t planning on, or really anything else… No matter the event, Emergency Management is, as a concept, prevent, protect, respond, recover and mitigate,” said UMass Lowell Direct of Life Safety & Emergency Management Rick Wood. From the moment that police dispatch becomes aware of any emergency event occurring on campus, they begin working to notify key emergency management “stakeholders” on campus. Among those stakeholders are UMass Lowell employees from Administrative Services, Facilities, the Office of Residence Life, Academic Affairs, Parking and Transportation Services, Campus Police, EMS and the Chancellor’s office Wood told the Connector on Tuesday. From there, the various offices work to assess both the direct risk to students and the impact of the event on university services to inform administrative decisions such as whether- or not school will occur that day. We all do our part to try to assess the impact – and we’re doing this whether we’re in the planning phase or the response phase. We’re asking if we have a safety impact to our buildings or students? Do we have any service impacts? Finally, we move into how serious those impacts are,” said Wood. The team quickly determined, in cooperation with National Grid, that there would be only minor street closures on East Campus and the timeline for full power reinstallation was as early as 8:30 a.m.
With a strong Emergency Preparedness Plan that Wood referred to as “excellent for dealing with events both planned and otherwise,” it was determined that temporary alterations to the bus routes could resolve most expected service issues. Despite a bit of mild disappointment from the student body that they had not been able to score a day off on the Monday after the Super Bowl, the day went even better than expected. Not only was power restored to the entirety of East Campus as early as 7:50 a.m., but Nicholas Piscitello, Director of Administrative Services, reported that Red Line service was restored to East Campus even earlier at around 7:30 a.m. The only problem Piscitello found worthy of note was that students seemed a bit uncertain and discombobulated by the back-and-forth transportation shakeups of the early morning which resulted in dispatch receiving an influx of calls and concerns until early afternoon. Still, Vice Chancellor of Student Affairs Larry Siegel told the Connector he was pleased not only with the Emergency Management Team Monday but also with positive student response.